Pressed flowers are real dried flower and air tight sealed. 15 Pieces Dried Pressed Flowers. - Shapes and colors of flowers well preserved. - Good for making greeting card, DIY your own phone case, and jewelry craft, also a good gift for your friends. Shapes and colors of flowers well preserved,great material for DIY craft project. - Material: Dried flower. 1 Bag Natural Dried Flowers. - Perfect for craft DIY scarpbooking, greeting card making, house decoration, Jewelry making, phone case decoration and so on. Winter Jasmine :Size: Approx. - Shapes and colors of flowers well preserved;. - Perfect for craft DIY scarpbooking, greeting card making, house decoration, Jewelry making, phone case decoration and so on. Pressed flowers are real dried flower and air tight sealed;. - Material: Dried Flower. - Shapes and colors of flowers well preserved;. 6 Pieces Pressed Flowers. Pressed flowers are real dried flower and air tight sealed;. - Shapes and colors of flowers well preserved;. - Material: Dried Flower. 6 Pieces Pressed Flowers. Pressed flowers are real dried flower and air tight sealed;. - Material: Dried Flower. - Shapes and colors of flowers well preserved;. 10 Pieces Pressed Flowers. People always bought together with. Shapes and colors of flowers well preserved;. 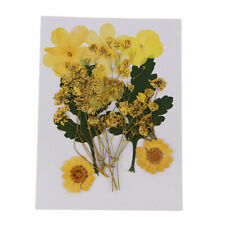 - Pressed flowers are real dried flower and air tight sealed;. - Material: Dried Flower. 10 Pieces Pressed Flowers. Made of natural Cat Face Chrysanthemum flowers thus each piece varies slightly in size and shape. - Material: Dried Cat Face Chrysanthemum Flower. 12 Pieces Pressed Dried Cat Face Chrysanthemum. - Shapes and colors of flowers are well preserved, looked very vividly. Chrysanthemum :Approx. Winter Jasmine :Size: Approx. - Shapes and colors of flowers well preserved;. 10 Pieces Dried Pressed Flower. Purple Daisy:Approx. - Perfect for craft DIY scarpbooking, greeting card making, house decoration, Jewelry making, phone case decoration and so on. Winter Jasmine :Size: Approx. - Shapes and colors of flowers well preserved;. 10 Pieces Dried Pressed Flower. - Made of natural Flowers or Leaves, thus each piece varies slightly in size and shape;. - Perfect for craft DIY scarpbooking, greeting card making, house decoration, Jewelry making, phone case decoration and so on.